Since Windows Vista, Windows operating system has included several useful and powerful context-sensitive menu items or right click menu items that are hidden from common view. Right click menu normally filled with usual suspect menu items such as Open, Explore, Search, Copy, Cut, Paste, Create Shortcut, Delete, Send To, Rename and Properties. 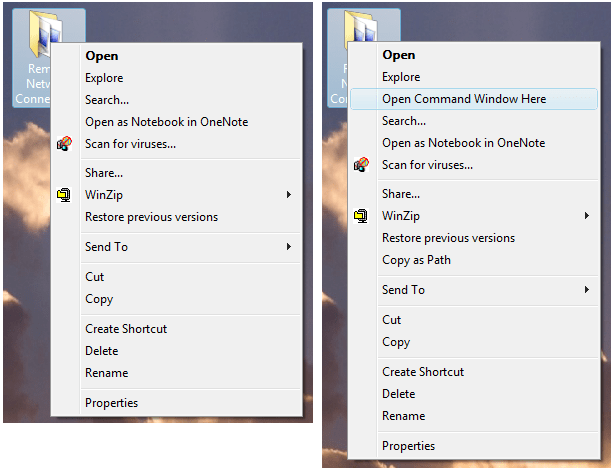 Among the hidden extra right click menu items include Open Command Prompt Here and Copy as Path. To reveal and get access to see the extra context-sensitive or right click menu items or menu commands, Windows Vista, Windows 7, Windows 8, Windows 8.1, Windows 10 and future versions of Windows users just need to press and hold down the Shift key while right clicking on any folder or file. Open Command Prompt Here is now built-in natively in Windows operating system, and is previously available to Windows XP users as an additional Windows XP PowerToys add-on. When a user click on Open Command Prompt Here while right click on a folder, a command prompt window will open with the current working directory automatically set to the folder’s actual location, instead of the default directory set by Windows’ environment variable (typically C:\Windows, C:\Windows\System32 or user profile folder). Open Command Prompt Here supports also the network location and mapped drive. If the target folder which the command prompt will change the working directory to is a network location or network folder, Windows will silently maps a network drive to that location before opening the folder to make sure that the command prompt opened has a valid path containing a drive letter, and will automatically deletes the network drive mapping when the command prompt is closed. Open Command Prompt Here functionality is especially useful for programmer or developer who always switching between Windows desktop explorer and command shell prompt at specific path, especially a very deep directory hierarchy, to access certain scripts or execute or build from command line. The Open Command Prompt Here eliminates the need to manually traverse the directories or folders with lots of “CD” command. You can also use registry hack to open “elevated command window here as administrator“. The next hidden right click menu item is Copy as Path. Follow the link to learn more about another useful hidden right click menu option that will retrieve and copy the full path to certain file or directories to clipboard memory.